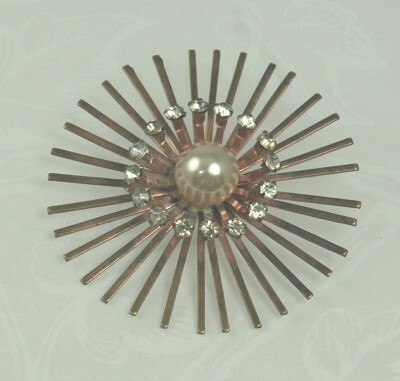 Here is a dimensional sun burst of copper rays and a cream colored faux pearl ringed in rhinestones. The rhinestones are clear crystal in color and they are prong set. The simulated pearl is 14mm. Condition: Excellent vintage. I have not polished this piece. Measurements: 2 1/2" in diameter.